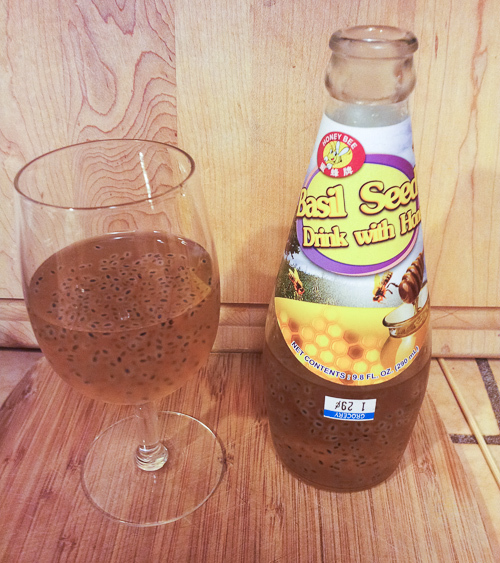 I was at a market in Oakland, California and found a drink called "Basil Seed Drink with Honey". There were black seeds suspended in the bottles. It looked interesting, so I purchased one. 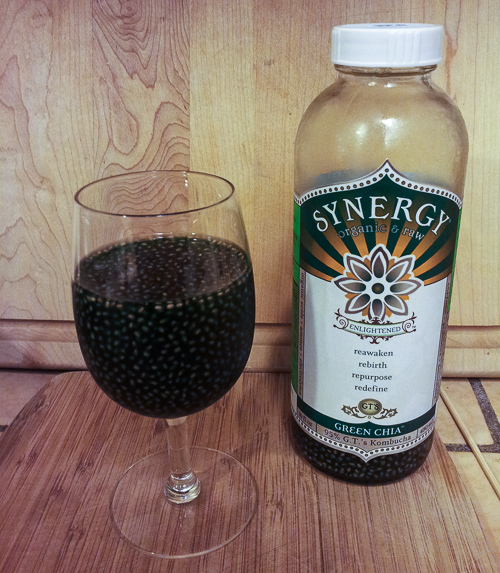 I don't remember ever seeing a drink with seeds in it, but later that day I was at a different supermarket and saw a bottle of Kombucha with green algae and chia seeds floating in it. I bought it for a taste test comparison. The flavor of the basil seed drink was unusual. It was a bit sweet and tasted like honey. The ingredients included "artificial flavor". The kombucha wasn't sweet. I've had other kombucha that was drinkable, but we couldn't finish this bottle. None of the four or five of us that tried them liked either of these drinks, but the basil seed drink was unanimously judged to be a little better than this kind of kombucha. Has anyone seen other interesting drinks with seeds floating in them? The concept is interesting, but so far I haven't found one that I like. Submitted by Anonymous (not verified) on Wed, 02/20/2013 - 07:17.
in thailand they use the basil seeds a lot. what they usually do is add it to water and then some sort of flavored syrup or fruit juice. but usually syrup; cheaper and sweeter. the thai name is mang luck. it can be really tasty if you get the ratios right. try and find the seeds themselves, not bottle drinks. you just add water, syrup, tea, juice, or whatever liquid to them and wait a while, put it in the fridge if you want, it'll puff up in five or ten minutes. Submitted by Anonymous (not verified) on Sat, 03/16/2013 - 09:02. Similar to Thailand, you can use Chia seeds and they will swell up almost the same. Use 3 oz of water for each teaspoon of seeds. Later you can add some fruit juice and leave in the fridge as a weight loss and hydrating delicious snack. Both types of seeds have health benefits. Basil seed can interact with some drugs, do your research and use in moderation with statins and others.